Permission granted to copy one copy to file and one on paper. Distribution in any format is theft. under the desk top which folds back. The very first thing to say is this-- Some men in the piano trade will not be pleased with this book. Why? First, the piano trade functions on the old guild mentality. They encourage tuners to be helpful and please the customer, but until the very recent the past, they have tried to keep the customer in the dark as to what it takes to tune and maintain a piano. This is sometimes out of snobbery as well as to guard the cash flow. Second, there is mystery among all those involved in music, and piano tuners share in this privilege. It is a luxury found in very few of the trades in the marketplace, and it is not a thing to cast aside carelessly, so I do have some sympathy for tuners who find this book objectionable. So why write this book and risk the ire of my fellow tuners? This may sound a bit mushy, but I am disturbed by the way customers have to wait six months for the tuner to work them into his schedule, only to find that the thing keeping two keys from working was a piece of rat manure or a 1947 New York subway token. I say, "Why not give piano owners the tools to take care of their own piano?" Also, as you may have guessed, I intend to make a couple of farthings out of this if it is a good idea. Thanks for buying the CD and for visiting our Online Catalog. First, I have tuned pianos for 20 years in Michigan (old upright nirvana), recently in Arizona, and now I am getting to know the nice pianos in Tennessee. I have seen most of the things that pianos can do, from "bird cage" actions to a sound board laying in the bottom of the piano in pieces. Believe it or not, the old beast is now singing again. Second, I am not in the Piano Tuner's Guild, so I cannot be threatened by "the trade." I have no "order of the peck" above me to convince me to hold back information. Third, I like to write. I would be doubly rewarded if I heard that this book saved you a lot of money. Having said that, I am delighted to note that there are some "Guild" tuners who are very open and willing to help do-it-yourselfers, but they wouldn't dare put it into print. These are great guys, and they will not be upset with this book. Your regular tuner may even be agreeable to follow up this book with telephone "technical support." Music is produced on hollow logs in the Congo and by 100 piece orchestras at the Lincoln Center. Thousands of instruments abound all over the world. The first artisan of instruments soaked a piece of goat skin, stretched it over a turtle shell, then he attached a wood neck and strung a piece of sisal or hemp along the top of the goat skin box. He snatched a few hairs from his horse's tail which he attached to a bent tree limb. Voila-- the first violin. The chief difference now is that, in the case of the piano, steel wire is used instead of horse's hair and hemp. But the world agrees that the piano is by far the best all around instrument. It has a good volume, keeps it's tune a long time, accompanies well, or solos splendidly, and it is very hard for the burglars to carry off in a suitcase. 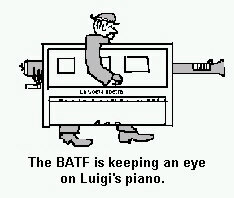 Also, if the Mafioso shows up at your party carrying a piano under his arm, someone is sure to say, "Look here, Luigi, You just mustn't come in here carrying a piano like that. People will think your have a cannon in it." Many things make musical tones, from pipe organs to Peterbilt trucks, but the piano has one of the most brilliant yet melodious tones. It combines percussion, as the hammers hit the wires, with the long decay (fading away) of the notes which upholds the music very well. Enough of this patter-- if you didn't agree with me, you would have bought a Sony transistor radio, right. So let's get on with it. Just one more question: Are there electronic pianos that sound as good as acoustical pianos? Answer: NO! The piano is a sweetly imperfect instrument. It has overtones and inharmonisity which have come to be part of its appeal over the past 500 years. Composers have used this quality to gain special sounds which the diodes dash and the transistors trash. The chip and oscillator wizards have yet to master this authentic aspect of the piano, nor will they for a long time. It is a quality gained with wood, steel, wire, and mass. But then we are a bit biased aren't we? 1. A frame- Whether a violin or a piano, this holds the beast together as a unit so that it can be used over and over. 2. Strings- These vibrate and generate the tones. 3. Tension- This is set so that the instrument agrees with music theory and so that the volume is agreeable. The trick is to keep from rupturing the whole thing. 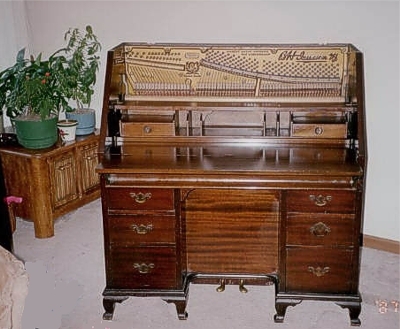 An average piano holds up to 12 tons of tension. 4. Some way to agitate the strings- Whether hammers, a bow, or your "lil ol fangers." 5. Most stringed instruments have a box or sound board to amplify the sound. 6. Ornamentation- Esthetics in appearance demand a tassel from an Ethiopian masenko, engraving on a silver flute, and an expensive glossy finish on a piano. This factor has nothing to do with sound, but I defy you to find me a musical instrument that has not added esthetics. It points to the fact that making music is an art form. Do you feel like a mechanical klutz? Never mind-- We can live with that. In each area of the book you will find something you can do, even if you have to call your clever uncle Harry in to help. Use the do-it-yourselfer's first tool-- bribe him with pizza. If nothing else, this book will at least give you an idea what is going on when the piano tuner comes. If you know a city well, you can keep the taxi cab driver honest. In the same way, knowing something about a piano will help you decide if your tuner is being honest with you. That's worth something. We will try to avoid technical language, and we will deal with "doohickies" and "whatchamacallits" as much as possible so that you can follow right along. I shall fill in a bit with Dutch humor, diagrams, and pixel edited illustrations which are provided to help you identify the parts of the piano, Enjoy!